Pick up this book! It is clever, unexpected and entertaining. 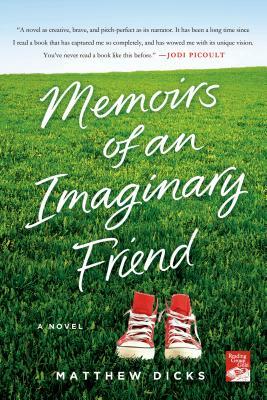 This "memoir" follows the lives of an imaginary friend named Budo and his boy Max. Rich in details, it is a loving portrait of a boy, his friend, his family and what it is like to be different. I never had an imaginary friend but if I did I would like him to be like Budo. Max is different from other children. Some people say he has Asperger's, but most just say he's "on the spectrum." None of this matters to Budo, who loves Max unconditionally and is charged with protecting him from the class bully, from awkward situations in the cafeteria, and even in the bathroom stalls. But he can't protect Max from Mrs. Patterson, a teacher in the Learning Center who believes that she alone is qualified to care for this young boy. When Mrs. Patterson does the unthinkable, it is up to Budo and a team of imaginary friends to save Max—and Budo must ultimately decide which is more important: Max's happiness or his own existence. MATTHEW DICKS is a writer and elementary school teacher. His articles have been published in the Hartford Courant and he has been a featured author at the Books on the Nightstand retreat. He is also a Moth storyteller and a two-time StorySLAM champion. Dicks is the author of the novels Memoirs of an Imaginary Friend, Something Missing, and Unexpectedly Milo. He lives in Newington, Connecticut, with his wife, Elysha, and their children, Clara and Charlie.